Mung beans make an appearance at lunch very often for me. Especially in the winter when lunch consists of Cleansing Kitchery or Bean Soup. Lately, I’ve been making a version of Moroccan Goodness using mung beans. They are just so easy to use, full of goodness and if you soak them overnight, they cook up fast. Two things I look forward to in the foodie world are 1) the monthly Alive magazine and 2) the bi-monthly City Palate. I picked up both new issues two weekends ago and spent some lazy moments this weekend flipping through them. Beans are on the menu in Alive this month which was perfect timing because even I get tired of the same thing for lunch now and then. It was time for a change and time to experiment in the kitchen. Eating monotony often means I’ve also been lacking in kitchen adventures which results in little to no blogging. Newly inspired, I tried the Mung Bean Pate Wraps. I had to alter the recipe because I found it bland. I can’t blame the recipe because I made mine without garlic and shallots, which is where a lot of the flavour would come from. However, I don’t like it when recipes depend on these ingredients for flavour. Even with onions and garlic, I don’t think the tomato flavour would have come through. So here is my more sattvic, pumped up version. Of course, add a bit of garlic and shallot or onion if you’d like. Soak the mung beans overnight or for several hours, the more you soak the quicker they cook. Rinse them off and bring to boil in about 3 cups of water and then simmer. If you soaked them overnight, they’ll be soft in 15-20 min, if you didn’t soak them, cover them and check them every 10 minutes until they are soft. Rinse them off in cold water. In a food processor blend the mung beans and the rest of the ingredients together. Blend until smooth. Add a tablespoon or more of water if you find it too thick. 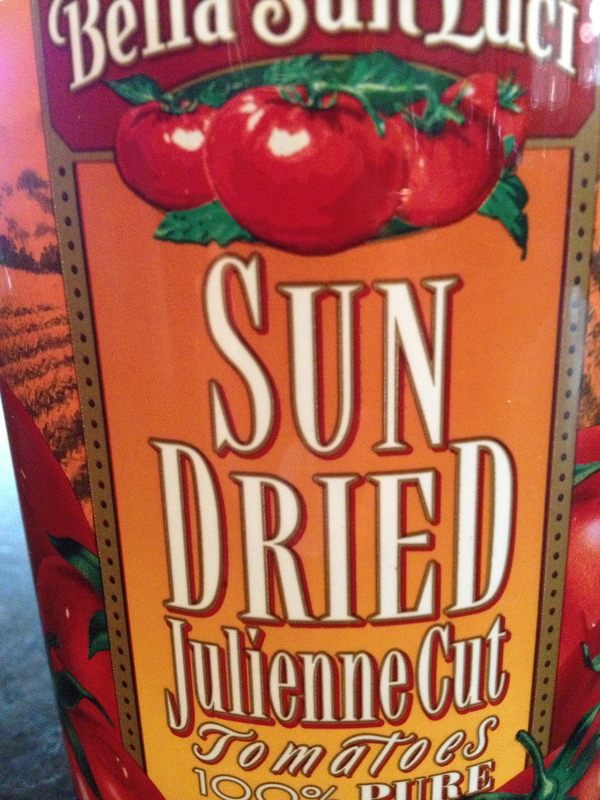 I buy a big jar of sun dried tomatoes at Costco, one of the few vegetable things that aren’t organic in our house, but you know, how can you resist the price and the amount you get! I smeared the pate on a spelt wrap, added some goats cheese and sliced yellow peppers for lunch. Delicious. Easy to pack to work, I just rolled up one of the wraps in plastic wrap so it wouldn’t dry out. 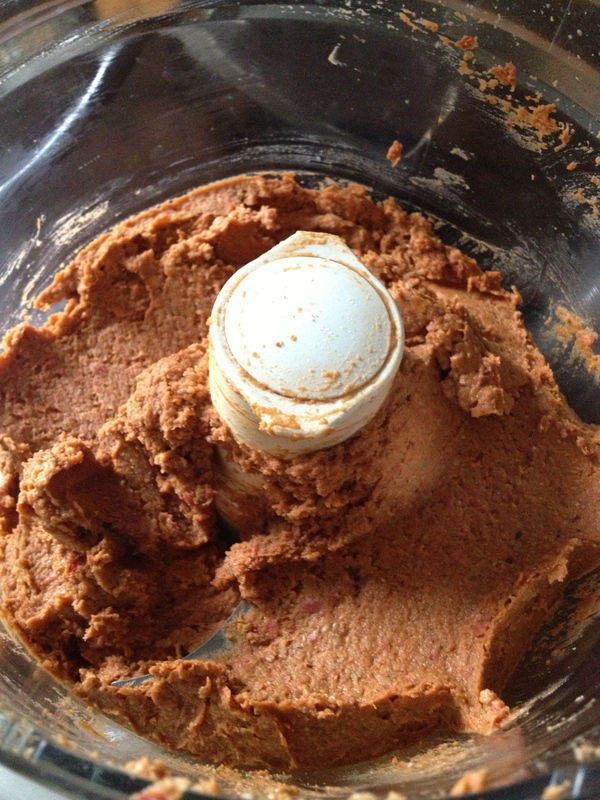 I put the pate and cheese into a small container the peppers in another container. Sliced cucumber and other veg like carrots on the side. Lunch is served (and had my colleagues saying ‘that looks yummy’ today at lunch). Have you tried mung beans yet? What’s your favourite way to use them?